Heinsberg/Germany – Due to their impressive color and shape variety, cichlids are among the most popular aquarium fish. Special food, such as the Cichlid Green XL and Cichlid Red XL novelties by sera, is required for keeping these colorful exotic fish lastingly healthy. 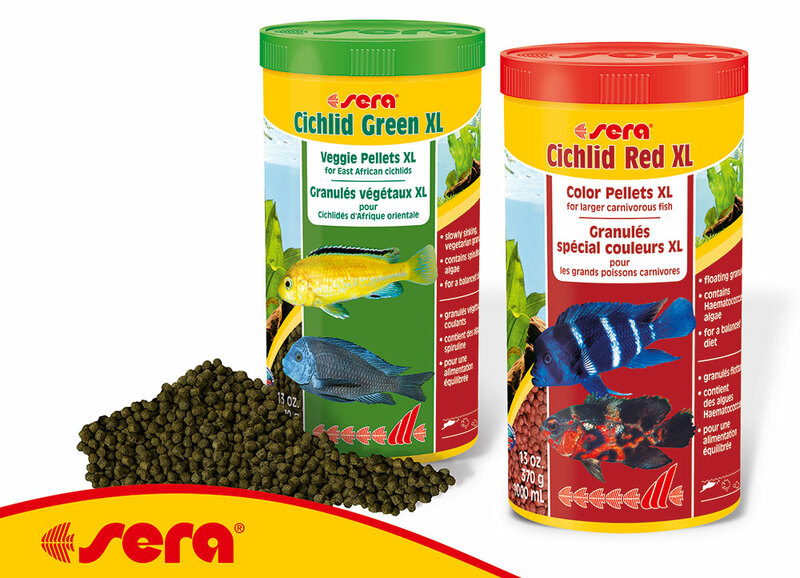 The sera food novelties Cichlid Green XL and Cichlid Red XL fulfill all nutritional requirements. Both products are floating granules that keep their shape, do not fall apart in water and thus also remain attractive for the fish after sinking down. Due to the special composition and their high quality ingredients, the food is not only particularly tasty but also easily digestible. Both Cichlid Green XL and Cichlid Red XL contain prebiotically active mannan oligosaccharides (MOS). These strengthen the body’s own immune system of the animals and support their intestinal health. A particularly high percentage of Spirulina or Haematococcus algae, respectively, furthermore enhances the natural coloration.